There are two three many things I miss about Canada; My friends, Tim Horton’s coffee, Montréal Smoked Meat Sandwiches, and the ubiquitous presence of Nanaimo bars at every donut shop and coffee house in the country. Every once in a wonderful while, a friend will send me a tin of Tim Horton’s coffee. My husband even had a tin shipped in for my birthday one year when I was feeling particularly homesick. But I had not had the gustatory pleasure of biting in to a lusciously sweet, decadently rich Nanaimo bar in over 5 years. FIVE YEARS. This was not an acceptable situation, and it needed to be addressed ASAP. I consulted my bestest internet friend, Google, who gave me a whole whack of Nanaimo Bar recipe ideas (about 80,600 in 0.22 seconds). I settled on this one. This recipe comes to us via Joyce Hardcastle and the City of Nanaimo, British Columbia’s website. It is the 1986 Ultimate Nanaimo Bar recipe contest winner. So it has to be the really, really, REALLY official best recipe, right? One of the few changes I made to the recipe was to reverse a step and add the hot cocoa and butter mixture to the beaten egg for the bottom layer. When I added the egg to the hot mixture, it cooked and curdled on me. Twice. I may have been a bit peeved. If you can make it happen, by all means go for it! I’m sorry, I tried. Despite my best efforts in Lightroom, but there was just no way to make this picture of the bottom layer look more appetizing. It is what it is, folks. Just keep repeating to yourself “Chocolate, almonds and coconut, oh my”. It worked for me, almost. The recipe calls for “Vanilla Custard Powder”, for which I substituted vanilla pudding. I did this because I have no idea what “Vanilla Custard Powder” is, nor do I have any idea where I might find it. A quick search of the baking sections of my two favorite grocery stores produced zip. Rather than bang my head on my cutting board in frustration, I just moseyed on over to the pudding section and grabbed me a box of vanilla pudding. I suggest you do the same. It’ll work just fine, I promise. If this brief explanation doesn’t satisfy your curiosity, you can take a gander at the exhaustive (and I really do mean ex-HAUS-tive) dissertation on the origins and history of the Nanaimo bar at practicallyedible.com. As for me, I’m not nearly as concerned with where they come from as I am about where they end up, which is on my plate. Before you settle in with a cup of tea to read that Nanaimo bar novel over at practicallyedible.com, I would suggest that you take a peak at a lovely little corner of the internet called Mangos, Chili and Z, which just happens to belong to an even lovelier lady by the name of Lea Ann. She recently did me the honor of asking me to be her first interviewee (interviewie? Interviewe?) for a new segment she will be doing called “Just Grilled”. I don’t know why she picked me. I don’t think she’s had any recent head trauma… But hey, you can always just breeze through the interview real fast and scroll on to the great recipes and wonderful writing that is her blog! 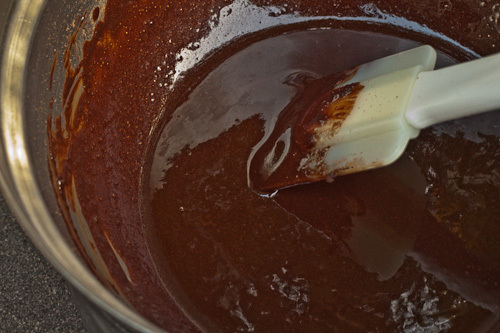 Combine the butter, sugar and cocoa powder in a double boiler and heat until melted. 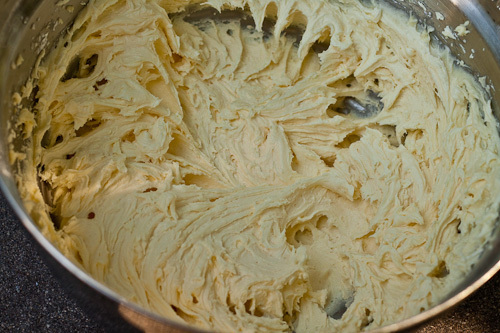 Slowly drizzle the hot mixture into the beaten egg, whisking constantly until thickened. 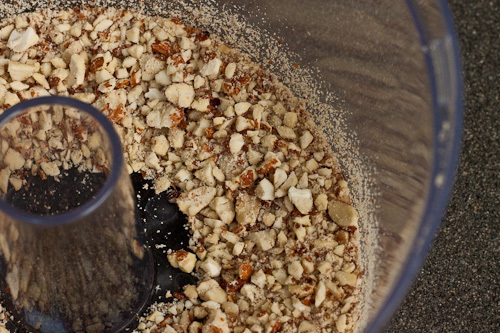 Stir in the graham cracker crumbs, almonds, and coconut. 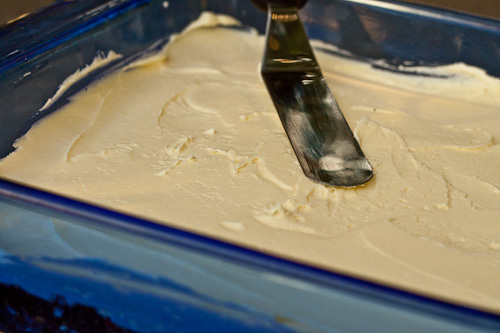 Press the mixture firmly into an ungreased 8″ x 8″ baking pan. 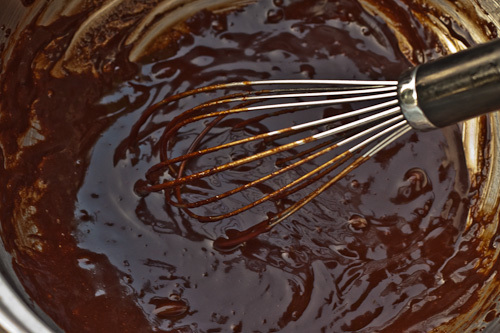 Melt the chocolate and butter in a double boiler over low heat. Once cool but still liquid, pour over middle layer and chill in refrigerator until set, about an hour. Cut into squares using a knife dipped in hot water. For easier (and neater!) pieces, dip the pan very briefly in hot water and then turn out onto a plate. Flip over using a second plate and cut into squares. I am from the United States and had never heard of custard powder until last June, when my husband’s company transferred us to South Africa. Here they sell custard powder as well as custard “sauce”. There are several brands available. However, if one chooses to use vanilla pudding mix in this recipe, should it be the cook and serve type or the instant? Also, would the flavor of black walnuts be too strong and overpowering if used in this recipe? I prefer them to English walnuts in most cases. I lived in Nanaimo for several years and made Nanaimo bars several times although, there, they are readily available in every food store’s baking section. If you use vanilla instant pudding (not cooked kind), it will be ok – but not the real Nanaimo bar. Bird’s Custard powder is what is called for and when added to milk, it makes a sort of ok custard sauce but not as good as a custard sauce made with fresh eggs and other ingredients. And you can buy Bird’s on Amazon —– http://www.amazon.com/Birds-Custard-Powder-Double-Size/dp/B000JMBE7M along with several other places. You CAN find custard powder in the U.S., you just need to know where to look. My local (Virginia) Giant (a chain grocery store) sells small cans of “Birds Custard Powder” in the “foreign food” aisle. It is right near the marmite and vegimite, and other “Commonwealth” foods (including Aero bars! oh joy). The mistake is to try and find it in the baking aisle…. The earliest recipes I’ve seen, from the 1950s, actually call for walnuts. Almonds seems to be a later variation. 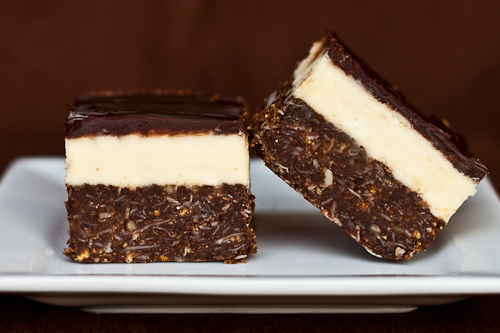 You may also see Nanaimo bars referred to as New York Slices, Parksville Squares, and Duncan Bars. Hi. Congrats on winning the sweet celebration at fun n food cafe. The bars look absolutely great. Do drop by whenever time permits. I google tonight looking for recipes for butternut squash and found your soup..but say Nanaimo bars and had to check it out. I laughed when I read that these were originally from the Companies Cookbook lol. Too funny..I have one of the original cookbooks from the first printing of that series. Very well used too! I am originally from Saskatchewan, and now live in Alberta. I have been married for over 34 yrs and have been making these all my life. My mother made them before me and I believe she learned from her mom how to make them. We have always made them with walnuts in the base and used Birds custard in the center. They were usually made as a “celebration” square for Christmas and Easter and birthdays too. Your version looks delicious too! You have a great site here and I have bookmarked it so I can come back and read more. The vanilla custard powder they refer to may be Bird’s Eye custard powder. It is a British staple and can be found at places like World Market and places like it. I am finally making these for tea today. Yay! As for custard powder – if you’re still going to look for it at the Indian Asian Store, I found one called “Ahmed Foods”. Gd luck! I am beginning to feel like a blog stalker…but thought I’d like to update you with how it went. My whole family loved it. I’ve updated it on my blog and linked you. Thanks! You can find vanilla custard powder at Publix grocery stores if you don’t have a Publix near you, try going online and look up Bird’s Custard. That might help you out. It’s an English product. 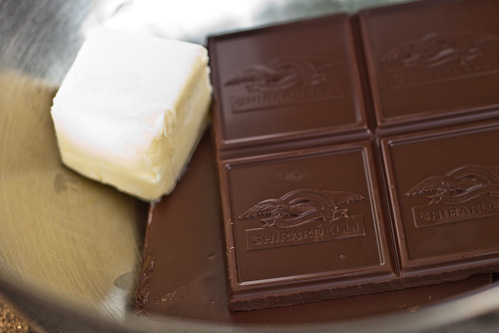 How do you cut nanaimo bars without thecustard squishing out? The chocolate doesn’t crack so that’s o.k. – but the middle squishes! Make sure the bars are chilled for a good while in the refrigerator. I had mine in a for a few hours. Then you need to use a very thin knife to slice them. If you can get the bars out of the dish they are in, they slice even better. I usually sacrifice the first piece, they I can pry out the whole thing. It also helps if you run your knife under hot water (make sure to dry it well) before you slice. I have the original recipe from my girlhood in Vancouver in the 70s… chopped walnuts were in the base, and Bird’s Imported English custard style pudding mix is what you’re after for the icing layer. Frankly, it’s the Bird’s that makes this confection so unique and memorable. Hi! Do you know if there is something else I can use instead of the vanilla pudding powder? I am neither from the US or Britain and have yet to see Bird’s Custard powder..
Hi,Bird’s custard powder is readily available in most major grocery stores (at least here in BC)in the baking section. If you don’t see it just ask somebody. I’m Canadian and have been making these since I was a kid. If you want to make them really “WOW” omit the cream from the custard filling and substitute the liqueur of your choice. My favorites are Bailey’s Irish Cream and Frangelico (a hazelnut liqueur). You definitely should try the custard powder. All of the other variations just don’t come close! OH YUM! I grew up in Nanaimo and these look just like the ones we used to buy at our local coffee shop that made them from scratch! I’d love to feature them on my site, http://www.canigettherecipe.com with full credits and links back to you if you are keen! You can contact me at carisnell@shaw.ca Looking forward to hearing from you! 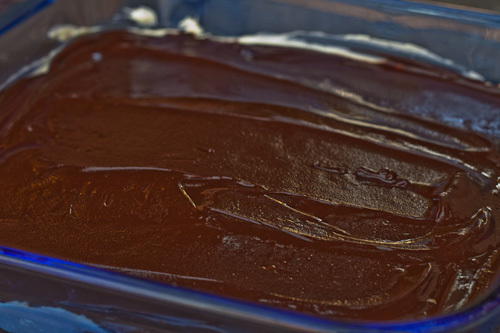 I believe the original recipe (I’ve been eating these since the 50’s) called for unsweetened chocolate on the top at least that’s how everyone I knew made them…. It cuts the sweetness of the bars and is absolutely delicious as you bite through the dark chocolate, into the sugary centre, then into the slightly crunchy bottom. Use bittersweet chocolate if you want a compromise – something dark is really the way to go! Try it, you’ll love it!! What a great idea Carol. You’re right; I bet a good bittersweet chocolate would really work well with the sweetness of the other layers. I’m going to have to give that a try the next time I make it. Thanks for the suggestion! Thank you for this recipe. I have used it twice now with pretty good results. Perhaps not as pretty as your, but the kids don’t seem to mind! The look fantastic, can’t wait to give them a try! As a BCer now living in Belgium, this is one of the few foods that I miss from home. I had a bit of trouble sourcing the Birds and graham crackers (I ended up getting some friends who were visiting London to bring them over), but I eventually made them for my European colleagues last Victoria Day. They were a bit sceptical at first, but the fact that the Nanaimo Bars disappeared within an hour speaks volumes! Thank you!!! I love them. I haven’t had these in 20 years. I moved from Toronto when I was 8 to NC, my dear husband who was born in NC is always asking me what is the difference between American and Canadian food, they are so similar it’s had to explain. So I thank you for reminding me about these my hubby loved them. Now if I can only convince him we all are not mounties and eskimos 🙂 Please if you have any other “Canadian” recipes let me know. Thank you again. I just returned from a two week holiday scross BC by planes, trains, automobiles and ferries. I tried Nainamo Bars every place we stopped for even a few minutes. The absolutely best used Bird’s Custard powder and walnuts and all of the other tradition ingredients. The bars I make at home have toasted walnuts in the bottom layer. What a great dessert! Now all my mom’s friends here in northern Idaho (where I am on an extended visit) are turning Nainamo Bars out for every occasion. This has been stumbled on from a person from Nananimo. I have to say, I for one… have never liked nanaimo bars. But I might have to try it, if it is homemade. It’s not a Nanaimo Bar without the custard powder. Pudding makes it — maybe – a Seattle Bar. Now that you have mastered Nanaimo Bars, how about trying Quebec’s Sugar Pie? lol — one pie can serve about 20 people – it is that rich. Bird’s Custard Powder is available on Amazon.com !!!!! You can buy “Bird’s Custard Powder” at World Market. I believe that was used in at least one “original” recipe. It’s a British thing, but they always carry it I think. I usually make mine coffee flavor, mixing in 1 T of instant coffee with 1/4 cup of boiling water, dissolve, then add a little at a time to taste and color. That is the best! I can’t seem to find the other flavors, but know they are out there. Good luck finding the Bird’s custard, it is a little different flavor and yummy. My sister, who married a Canadian, learned to make these years ago and it has been a Christmas staple at her house. I tried the recipe myself, but it turned out way way too sweet every time I made it. I wonder if its the Bird’s custard or the icing sugar (powdered sugar). I’d love to try it again, but wonder how to vary the recipe so its not ‘hurt my teeth’ too sweet. My aunt brought the recipe to the States after visiting BC in the 50’s or 60’s. We make it every Christmas. 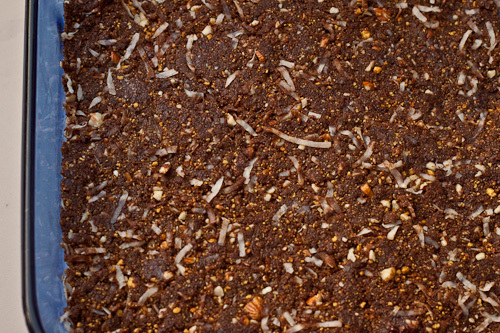 We use chopped pecans in the bottom layer. For the top layer, we melt an 8 oz Hershey bar with 3 tbsp butter (in a double-boiler) and spread it over the chilled two bottom layers. Have used Bird custard but usually vanilla pudding powder. Didn’t really notice a difference. Will have to try some of the variations suggested (mint, peanut butter). Fun to read about them. thanks. We have made these for many years and use the ingredients you describe (pecans in the bottom layer), vanilla pudding powder for the middle layer, and melted Hershey bar with butter for the top layer. My Aunt and Uncle had traveled to Canada many years ago and brought back the recipe. Not sure if they changed the ingredients or what happened (this was probably in the 1950’s). We make it every Christmas. (From St. Louis). I didn’t read all of the above but I also grew up on these. We assumed they were German/Dutch because Gram a Johnson made them at Christmas time and she was Dutch… I HATE walnuts!!! I do however prefer Almonds as that is the way I can eat them. I allergic to walnuts! Not only that they make it taste like wax. Thanks for recipe. Its too late to call my Mother. I am a canuk but now live in slc, utah. I want to buy nanimo bars I cannot find any where to purchase. I am to lazy to make. Help I am having major cravings. Hi and thanks for the great recipe. We are from Canada and just moved to the Dominican Republic and have been making Naniamo bars here. Everyone we’ve shared them with just love them. Especially the Canadians. I am wondering where you got the custom make chocolate molds you used on the top of your bars. Looks very professional. thanks. I didn’t use a mold, just melted the chocolate and let it harden on top. I cut the chilled bars with a warm knife, wiping the knife after each cut which makes the cuts very clean. I made a batch of these last night and have some questions. Directions say to pack the bottom layer firmly, which I did. After coming out of the refrigerator, the bottom layer seemed very stiff. Is this normal or did I pack it too firmly? Next, Should they be refrigerated when finished? They are very good, but very sweet. I need to cut smaller squares. Yes, it’s supposed to be very firm, so that it doesn’t crumble when you cut it. Don’t worry, you can’t over-pack it :). If your kitchen isn’t too hot, you can leave them out on the counter. The refrigerator will just make them firmer. What is icing sugar? Is it powdered sugar? If so, is it sifted? If so, before or after measuring? Icing sugar is called Confectioners’ Sugar or Powdered Sugar in the United States. Birds custard powder can be found in the food section of World Market if you live near one. I found it in World Market in Sioux Falls South Dakota, if I can find it anyone can.